There’s no question that the return on investment for programs designed to help hospitals convert from previous Medicare payment systems to the Inpatient Prospective Payment System was ensconced in Medicare revenue improvement. Back then, in the early 1980s, people didn’t know how to assign ICD codes much less diagnosis-related groups (DRGs). As a result, consultants helped hospitals find ICD codes that would affect DRG assignments—identifying complications and comorbidities (CCs) and more lucrative DRG assignments—by creating ways to influence the principal diagnosis code or identifying operating room procedures. It helped create the concept of what would eventually be known as clinical documentation improvement (CDI). During the experimental stages, mistakes were made and hospitals wound up paying significant fines for fraudulent billing through the Office of Inspector General. Other overseers levied repayments for “innocent mistakes,” and the costs of oversight and defending positions started to exceed billing department costs. Some consultants identified conditions as complications of medical care or complications of surgeries. Hospitals made more money, but they didn’t care. Then organizations that measured patient safety and harm started to publicly report organizations with high complication rates. Patient safety indicators and hospital-acquired conditions were introduced, putting a crimp in the market share of hospitals lacking in these areas. Health care organizations with high complication rates could no longer gain “preferred provider” status with insurance companies. Smart organizations found a solution: Correctly identify what’s wrong with patients through proper documentation and coding, and the finances will take care of themselves. Don’t play around with assigning codes for dollars and limiting a program to Medicare patients. Blue Cross, Anthem, Aetna, UnitedHealth, Humana, Kaiser—these payers have patients, too, all of whom are seeking safe, quality care. CDI programs that focus exclusively on Medicare patients shortchange the service lines and the physicians who deal with non-Medicare patients. A hospital’s statistics suffer because today’s analytics are examining patient outcomes regardless of patient type, service line, or attending physician. The industry is used to the Medicare DRG system, but Tricare also has used DRGs. Meanwhile, long-term acute care hospitals utilize a Medicare DRG system with slightly different relative weights. On the state level, New York has used different models for its Medicaid system, including all-patient DRGs. Maryland employs 3M’s all-patient-related (APR)-DRG system in nearly all of its hospitals for all payers and patients. More states are converting their Medicaid systems to base hospital payments on a total compilation of pertinent codes. For example, California and Texas are changing to APR-DRGs by identifying all diagnoses treated and all procedures provided during a hospital stay. It’s not only the inpatient environment that benefits from more comprehensive diagnosis coding. For example, both hierarchical condition categories and capitation rated with severity-adjusted dollars per member per month are being used more frequently for physician office payments. As a result, counting bullets for evaluation and management codes may disappear, and instead evaluation of complexity of ICD-9 or ICD-10 codes will drive office payments. Organizations that grade hospitals, whether it be alliances such as The Delta Group, the University HealthSystem Consortium, and Premier, or public entities such as HealthGrades and the Centers for Medicare & Medicaid Services, cull data from severity-adjusted algorithms. Some use APR-DRGs, while others have created their own algorithms. The resulting data can help health care consumers differentiate between competitors and perhaps be a deciding factor in which physician or hospital they select. A CDI program that prioritizes medical staff leadership and promotes compliant, ethical definitions and processes will score high in all arenas across various patient types, service lines, and physician groups. 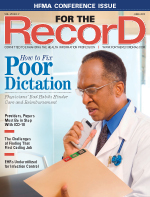 If a CDI program only concentrates on identifying a principal diagnosis and a secondary diagnosis that meet the definition of a CC or a major CC, the database will not reflect chronic, stable conditions for proper discharge planning and care coordination—one element integral to the concept of value-based purchasing. If care management tops the list of patient needs prior to discharge, a hospital will experience fewer readmissions, higher patient satisfaction scores, and better long-term outcomes. If significant comorbidities and other major CCs are unknown, the severity-adjusted length of stay, mortality rate, and cost of patient care will be excessive. These data are factors in value-based purchasing. More robust ICD-coded data regarding a patient’s experience in the acute care setting lead to higher bundled payments to be shared among the hospital, treating physicians, and consultants. By providing diagnostic evidence of medical necessity, a hospital can better reflect utilization of resources, leading to fewer denials. A CDI program working to identify codes for surgery complications as a baseline that doesn’t analyze the condition after the procedure is missing an opportunity to shine in the community’s eyes. It must determine whether the complication was caused by the initial disease, another disease, an adverse effect of medications or anesthetic care or was unrelated to the operative procedure. Attacking surgeons to document “postoperative this” and “postoperative that” is not a sound strategy. If the program does what it should—identify all surgery complications and avoid attributing something that was present on admission or an incidental event—then the data will properly reflect the hospital staff’s skill and expertise. Should documentation efforts stray, it could lead to serious misconceptions within the industry and with the general public. For example, many hospitals have numerous reported incidences of postoperative respiratory failure because someone told the intensivists to document the condition whenever a patient is reversed from anesthesia in the ICU. The medical profession has lost some perspective since third-party payers got into the mix. The current tide is trying to recapture the days when textbooks were the guiding light. When a CDI program helps physicians properly capture the complete patient experience, whether it be in an acute care facility, an office, or a skilled nursing facility, the hospital can’t help but survive, medical staff can’t help but prosper, and patients can’t help but enjoy the best possible outcomes. That’s the true return on investment of a CDI program—and it should always have been that way. Maybe too many of us just got distracted. — Robert S. Gold, MD, is the CEO of DCBA, Inc.